Family Reunions, Wedding Parties, Bus Tours, Corporate Retreats, Motorcycle Tours and Cycling Tours Welcome! If you are organizing a group tour then please contact us to arrange the details. Our group rates are highly competitive, plus we can custom the tour to suit your needs. For instance, with our partners at Sea Spray Outdoor Adventures, we once provided fresh Atlantic snow crab to the passengers of a corporate retreat while we anchored at Cape North and watched a playful seal colony. Guided Hiking, Guided Cycling, and Guided Whale Tours with Accommodations Included! If you are interested in a complete vacation package while staying in the area, which can include guided hiking tours, guided cycling tours, and a guided whale watching tour with us, then please visit our partner: Cabot Trail Adventures. 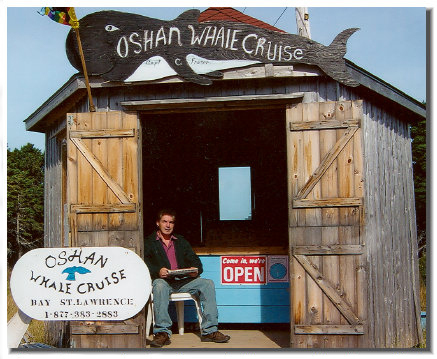 Captain Fraser Awaits Customers in the Oshan Whale Watch (formerly Oshan Whale Cruise) office in Bay St. Lawrence. Since we have opened, we have done our best to accommodate walk-ons and last minute reservations. Pets are welcome aboard at no extra cost! We are also happy to look after pets onshore while you are aboard the Oshan. Pets and people love our handmade benches. © 1998-2016 Oshan Whale Watch. All Rights Reserved.